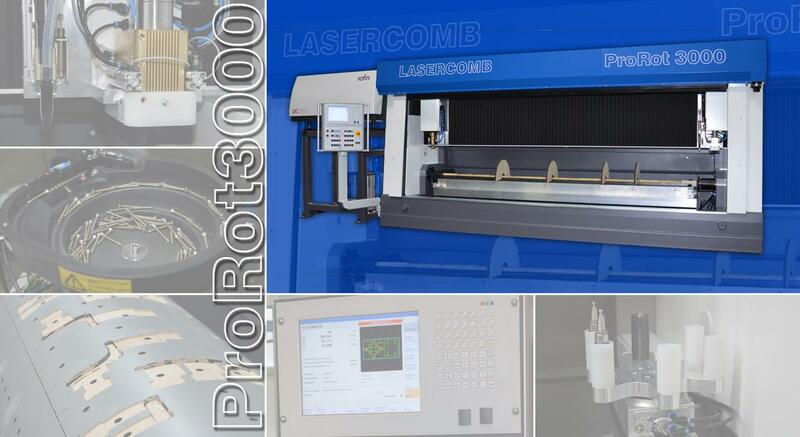 The modern ProRot 3000 system is newly developed for laser processing of rotary half shells. Optionally an additional and controlled axis with milling spindle is available to process all kinds of typical surface milling of rotary half shells. The setting for the half shells is construed for high precision. We looked out to construe all mechanical elements for the clamping process out of the thermal effects of the laser beam. The working area is a completely self-contained system while cutting. Combined with an efficient suction the leakage of flue gas is minimized. The setting-up of the half shell is either taking place on an external set-up station or – if your machine is equipped accordingly – the system automatically screws together the half shell on supporting discs. Your ProRot 3000 system can be adjusted according to your requests by means of various extensions. Therefore the following options are available. An ever-increasing amount of information is engraved on the cutting die. Especially markings are extremely time-consuming because of low movement speed according to very detailed contours. With this option, we offer the opportunity to drastically reduce processing time of engraving. Laser beam is moved with speeds of up to 12m/s (720m/min) by means of a galvanometer scanner. Thereby in each case is a quadratic partial surface for example 200 x 200mm labeled. After that the scanner unit is repositioned and the adjacent partial surface gets labeled. Division in partial surfaces is fully automated. Conventional engraving by laser nozzle can be used optionally. Also for rotary processing the LaserScan can be used with some restraints. Application: Fast laser engraving of labels, position marking, line numbers, logos, etc., special engravings on various materials. Milling processes on the shell surface are part of the daily work for a long while now especially for rotary cutting dies. In various applications, for example the so called “Evol-Dies”, a great number of different milling grooves is required. Accordingly, we offer an additional milling axis which is independent and a controlled Z-Axis and also equipped with a 3,4 kW spindle. Additionally, it can be complemented with an automated tool replacement. The tool replacement system is equipped with 5 tool places and a measuring station to survey the tool length. The milling process is supported by upstream height sensing. Consequently, a uniform cutting depth is secured even with different wood thicknesses. Application: all typical milling processes for Posilock, rubber coating, Evol-Dies, reductions, chamfering, etc. The additional external set-up station enables you to prepare the half shells completely for the clamping process while machine is running. Consequently, the time for replacement and setting-up is reduced to a minimum. The station can be equipped with laser pointers to mark screw positions on the surface. A supplementary screw unit, which is equipped with a screw depot to install the screws without pre-drilling or handling, can be provided. Automated screwing of half shells in the machine is an entirely new possibility. 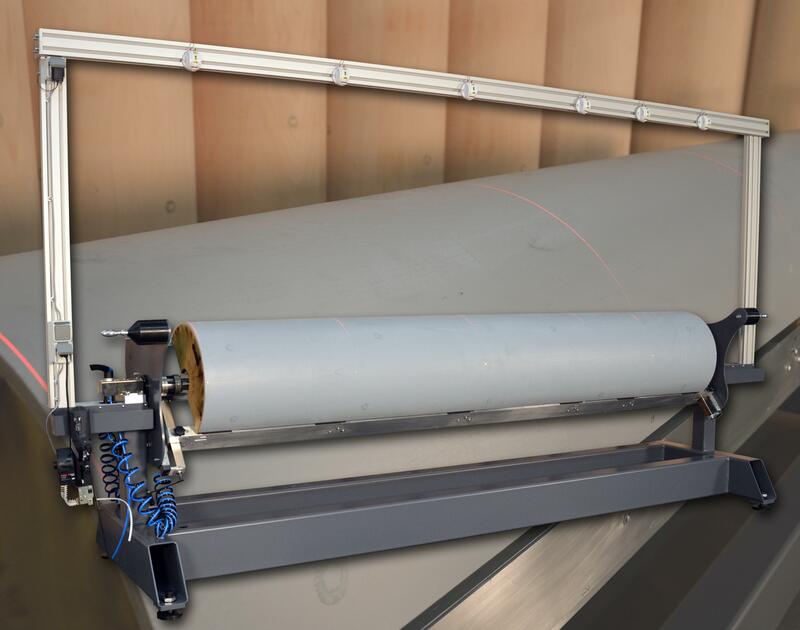 The half shell will be placed on the supporting discs, the machine recognizes position and length of the half shell and autonomously screws it together before the laser processing is initiated. An automated collision detection for the screw positions is integrated and a major advantage in this procedure. Screws in the areas to be milled are disruptive and cause damage to tools. This option allows excavating of shells from turnbuckles.